If you were kind enough to check out this week's Wordless Wednesday post then you already caught a glimpse of the maniacal debacle that was my first triathlon experience. 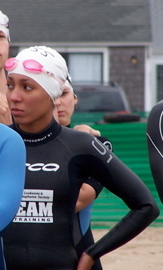 During the summer of 2006 I completed my first and so far only sprint triathlon. I have always been physically active. I lived in the gym prior to my two year pregnancy stretch. I would do an hour of cardio a day and lift weights for an hour. At least five days a week. For variety I would throw in swimming, yoga, pilates, and capoeira every once in awhile. I was never a natural born athlete and have no issue admitting that. I worked out to feel and look good. Period. At this time in my life I also participated in several volunteer opportunities including acting as a Big Sister and working in a medical clinic of a homeless shelter mornings before work. So I was vain BUT also charitable. They cancel each other out (CrunchyVTMommy math). Around this time my beloved Nana was diagnosed with a white blood cell cancer known as Multiple Myeloma. Coincidentally I received a mailing from the Leukemia & Lymphoma society detailing the Team in Training program which provides workout plans, support, and team workouts. I raised the entry/donation fee (I wanted to do something charitable in Nana's name) and the adventure began. I had been working out like a fiend for years but had never had to follow a structured program. Training for a triathlon is no joke. I definitely did not swim enough (not ONCE in open water and I lived streets away from the freaking ocean at the time) and I did not get on my bike outside enough (I rode it on a fancy trainer inside my house 80% of the time). My Nana passed away before the date of the triathlon. I was heartbroken but continued with my "training" and chose to race in her honor. I had a nice dinner with my family. A strawberry daiquiri was calling my name. I ordered it. This would later turn out to be a fateful decision. We had to drive from the hotel to the race site. Upon arrival it was time to put my road bike back together. See I am a moron and decided that instead of purchasing a bike rack I would take the bike apart and stash it in the back of my mother's Hyundai. Please note: I do not know how to take a bike apart and/or put it back together. As I stood amongst the crowd of triathletes I suddenly realized just how screwed I was. This was my first open water swim. Despite the fact that the course had been shortened due to the recent awful weather I was pretty terrified. I am not too sure what I was terrified of. Perhaps it was a combination of the giant waves, swimming amongst a mass of thrashing strangers, or the threat of a random shark attack. I have no idea but I started to worry. So I walk in s l o w l y. Everything is fine and then I realize that it is time to get horizontal. My breathing is very shallow and the wetsuit feels incredibly constricting. I am dying on the inside. Little kids are doggy paddling besides me laughing and having a great time. I am pretty sure an old lady (probably the 73 year old woman that completed the entire tri course an hour before me) did the backstroke right over my body. It was time for some quick thinking. I swam hastily to one of the safety floats. There you are given words of encouragement and support, told repeatedly that you will not die, and given an opportunity to rest. I swam from safety float to safety float until there were none left and it was time to finish the course. I began to panic once more. I started to flail my arms about wildly with an occasional alligator/crocodile death roll tossed in for effect. No one was paying attention to me. I knew I had to make my way out of the scary ocean on my own. My faux drowning attempt was unsuccessful so now I just looked like a loser that sucked at the swimming leg of the tri. Coincidentally I was also now in shallow water. I had spent some much energy summoning some sort of a rescue that I hadn't realized that I could now stand up in the water. 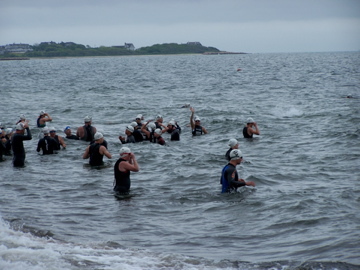 There were some very nice people cheering me on as I exited the ocean (I am pretty sure I was the last person. I HAD to have been). Then I spotted my mother. My mother says "Wow. I thought you had drowned! You didn't. Good for you".